SOME ROAD TRIPS start with a frantic airport, frenzied lineups for rental cars, and countless miles navigating through busy interstates with a rental GPS unit barking things like “take exit 5,452” and “make a u-turn” — all this to get to the good part. Not so in Montana. Step off the plane at the Great Falls International Airport and it’s mountain breezes from the get-go. It’s wide-open skies, mom-and-pop pie shops, roadside mountain goats, snow-capped peaks in July, quirky saloons, and Shakespeare in the most surprising of places. Here’s an itinerary to hit it all on a road trip, starting smack dab in the middle of the best the state has to offer — Great Falls, Montana. You can literally go from Great Falls International Airport to cliff-lined canyons, lazy rivers, and golden eagles in twenty minutes. 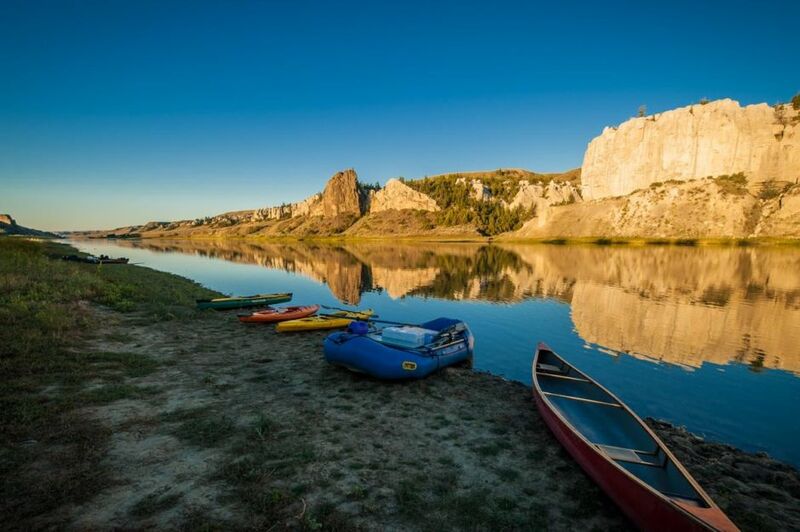 Hop in the rental car and head to the Upper Missouri River — it meanders through the city of Great Falls — to have that first moment (call it road trip zen) where you take off your shoes, find a shady spot, and relish the fact that you made this awesome decision in the first place. You saw it as you landed: that snaking mammoth cutting across the plains. The Missouri River makes its way east via rapids, cliffs, and secret beaches, all the way to the Mississippi and the Gulf of Mexico — and this spot is home to one of the densest populations of river trout in the Lower 48. Not to mention the osprey, bald eagles, and doe-eyed bighorn sheep that’ll be joining you. Rent a raft or kayak and take it all in from the river’s point of view — or head towards the nearly 60 miles that make up the River’s Edge Trail to stroll through river canyons, past public art, and check out the free telescope at the Warden Park Gazebo. And if you haven’t had enough water, you can still head to the Electric City Water Park. It has its own lazy river, plus body boarding, a massive pool, picnic areas, and waterslides guaranteed to wake you up — with names like Rip Tide Slide and Power Tower Plunge. Now that’s a way to set the tone for a road trip. The mountains are probably calling at this point. Now, you could hop on I-15 and be at the park gate in a couple of hours. Or you could take the slow road and stop in at tiny towns with old-style general stores and saloons so obscure they don’t even have Yelp pages — after all, who needs Yelp when you’re literally the only place in town? Get your feet wet in Montana culture by taking old highway 89 as you head toward Glacier National Park. They don’t call Great Falls the gateway to genuine Montana for nothin’. Stop by JD’s Wildlife Sanctuary in Bynum — never mind the tough exterior. Pull up a stool, order a beer, and ask the bartender if there have even been any shootouts in this joint (hint: There have. It used to be a bank and nothing says Wild West bandit lore like bank robberies). Head north and poke your nose in the Dupuyer general store for groceries, yarn, and crafts in a town with a population of 86. Then carry on — the mountains are looming to the west — all the way to Browning. Stop in at the Museum of the Plains Indian and take some time to consider who the first peoples were in this area. The Blackfeet people and their ancestors have called this area home for close to 10,000 years. And it’s no wonder why. Veer west from Browning and you’ve made it to the aptly named Crown of the Continent in Glacier National Park. You’re about to cross the Continental Divide amid some of the most dramatic peaks in the Rockies — this jagged spine was thrust up to the sky by tectonic activity more than 150 million years ago, and the power of the jolt is still obvious today. One of the best ways to really get a sense of the landscape here is to drive — or cycle! — the Going to the Sun Road. It’s 50 miles of lush forests, glacial lakes, and holy-hannah-are-you-seeing-this scenery, including sheer drops and spiky summits. Even if you didn’t stop, the hairpin turns and tight lanes mean this drive will take at least two hours — and to not stop would be madness. 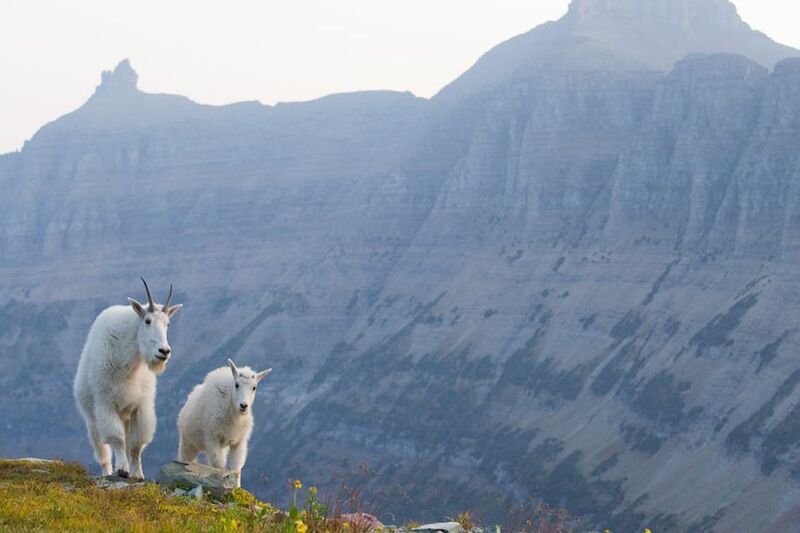 At the road’s summit — 6,646-foot Logan Pass — mountain goats will sidle past like it’s no one’s business, and there are countless trailheads waiting for your feet to join them. Whether you want to go for a short stroll or take in the world from the 12-mile Highline Trail — a cliff-side, blow-your-mind path winding its way along the Continental Divide — there’s no shortage of excuses for leg-stretching. Not to mention the chances to see grizzly bears, eagles, wolves, black bears, deer, elk, and moose. If you’re somehow thinking this is just some hum-drum, dime-a-dozen mountain road, consider this: This is one of the most difficult roads in North America to maintain. Snow plows often carve away at 100-foot snowdrifts here until late June, meaning this road is truly seasonal. You can spend days or weeks exploring Glacier National Park — it’s been dubbed an International Peace Park, World Heritage Site, and a Biosphere Reserve for a reason — but at some point you’re going to need to head to St. Mary for the best slice of huckleberry pie this side of anywhere at the Park Café… which is conveniently located on the way to Canada. Canada is just a (literal) stone’s throw away from Glacier National Park, and the Canadian Waterton Lakes National Park is the other side of the Waterton-Glacier International Peace Park. Not only does a trip to Canada from the east side of Glacier mean an excuse to stop for the aforementioned huckleberry pie, it also means totally free access to all national parks and historic sites in the country. The neighbor to the north turns 150 this year, and to celebrate park admission fees have been reduced to zero. Zilch. Nada. Happy birthday, Canada! So pack your passports and head to Waterton. Take in the views from the iconic Prince of Wales Hotel — built back in the ‘20s — and stop in for a classy high tea served lakeside by servers in kilts… because why not? Stretch your legs on the short-but-steep Bear’s Hump Trail for views across to Montana, and fuel the appetite you’re sure to build up with a local obsession, Wieners of Waterton — they serve up massive gourmet hotdogs that drive Canadians wild. And yes, they’re serious when they ask if you want potato chips on your ‘dog. Waterton is a small park with lots of trails and two main scenic parkways, and is close enough to Montana that you can head up for just a day if you want to, before getting back to Montana to carry on — ‘the Bob’ is waiting. Glacier National Park is amazing, but it’s not all Montana has to offer on the wilderness front. The grizzlies and goats know no boundaries, and spend a decent amount of time in the third largest wilderness complex in the country, the Bob Marshall Wilderness. Locals call it ‘the Bob,’ and it’s found to the south of the national park, pressed up against the Seeley-Swan Valley. It’s easy to access from the west side of Glacier (i.e. the other end of the Going to the Sun Road), and meandering your way south of Kalispell means ample chances to enjoy Flathead Lake — the largest freshwater lake this side of the Mississippi, with 185 miles of shoreline. If you don’t get sidelined with hours of lakeside napping, the Bob is made up of 1.5 million acres of prime backpacking territory — it’s only accessible by foot or by backcountry landing strip. Even if you’re not up for a days-long exploration, poking your way around the edges is well worth a stop. The 3-mile round-trip hike to Holland Falls will take you on a lakeside stroll to some seriously mighty waterfalls. Stay silent, walk on your tiptoes, and keep your fingers (and toes) crossed — and you might just spot an elusive wolverine. Biologists say there are only 300 left in the Lower 48. Chances are slim, but huge wild areas like the Bob are prime habitat. Look for a really big weasel with long claws. Hiking, boating, and pie-eating can get exhausting, so make sure to leave some time at the end of your trip to relax in Great Falls. Montana isn’t all about cowboys and mountain peaks, and Great Falls is a definite contributor to the state’s thriving art scene. Not only does it play host to the Montana Shakespeare in the Parks Festival several times throughout the summer, but Montana galleries open up their doors on the first Friday of every month for First Friday Art Walk in downtown Great Falls. Stop in for coffee and farm-fresh goodies at Electric City Coffee, or for a pint of Guinness and some Irish classics (corned beef and cabbage, anyone?) at the Celtic Cowboy, and stroll through the city’s art scene. And no road trip in the Big Sky state is complete without paying homage to one of the greatest artists of the American West, Charles Marion Russell. If you’ve ever marvelled at a painting of some combination of mountains, cowboys, horse battles, and Aboriginal people, chances are pretty good it was a work of Russell — after all, he created more than 2,000 paintings set in the west. Check out the C.M. Russell Museum gallery or his preserved home and studio for his sketches, sculptures, and multi-million-dollar paintings. As your road trip winds to a close, make your way back to the River’s Edge Trail to explore the most awesome of American sojourns at the Lewis and Clark Interpretive Center. Settle in for a short movie about the duo’s 8,000 miles of adventuring, or show off your newfound wilderness acumen by pulling a boat against the Missouri’s current. Not far away is Giant Springs State Park, a spot Lewis and Clark stopped at back in 1805. Check out the fish hatchery or just throw down a picnic blanket by the river, wait for the sunset, and watch the shadows get longer and longer. And to polish it all off? Great Falls is home to four microbreweries, like the Mighty Mo Brewing Company, where you’ll find live music in a historic building downtown. Grab a pint of Rising Trout and cheers to one heck of a road trip. This post is proudly produced in partnership with the Great Falls International Airport.